I had the singular honor of speaking to about 100 brethren on Friday night at the Henry Wilson Coil Masonic Museum in San Francisco. Alice and I had an incredible weekend in San Francisco, and I owe a huge note of thanks to Worshipful Brother Adam Kendall. It was a great opportunity to meet so many brethren I have only known electronically, and make new friends as well. 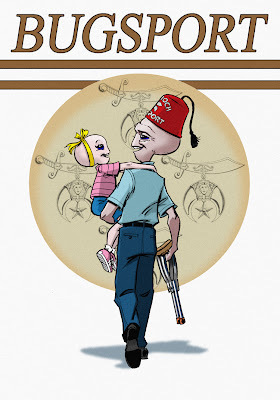 And many, many thanks to the brethren of the Southern California Research Lodge for all they have done to promote Freemasons For Dummies and Solomon's Builders. We had great fun with Margo and John Heisner at the Grand Master's banquet. It was also especially fun to at last meet Brother Andrew Horn, whose work I have long admired; the boundlessly enthusiastic Brother Manny Blanco, with his lady Ruth; Brother "Sarastro"; and of course the brethren with whom we shared a pint or two at Zeki's – Adam, Brent, Chris, Ken, and others far too numerous to mention. 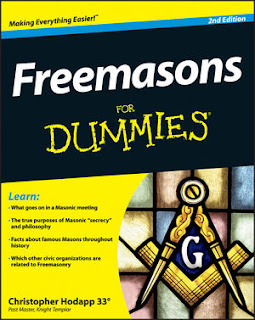 But the most humbling experiences of the whole weekend came from the many young brothers who stopped me to say that Freemasons For Dummies had influenced them to become Masons. That is perhaps the greatest compliment anyone has ever paid me, and I cannot begin to express those emotions. My deepest thanks to all of the brethren in California for the incredible gift of this weekend. The battle for West Virginia seems to be heating up. The Grand Lodge of New York has announced what promises to be an outstanding evening in December, with a great topic and a stellar panel. "The State of Masonic Education" - A lecture and discussion by a panel of Masonic researchers and scholars. • S. Brent Morris (WM, Quatuor Coronati Lodge No. 2076 (UGLE), and the first native born American to hold that office). •Peter Currie (SW, QCL and Editor of the lodge annual transactions "AQC"). • Yasha Beresiner (PM, QCL, lecturer and published author). •Trevor Stewart (PM, QCL, and Prestonian Lecturer UGLE). •John Wade (Sheffield University's Centre for Research into Freemasonry). Reception 6 pm, Lecture 7 pm. Subscription $75. No Tickets at Door. Lecture is open to all EA's and FCs. Apply before Dec. 3rd. Sponsors are being solicited - contact the Library: 212- 337-6620. I'm supposed to be finishing a manuscript and shouldn't have time to read Masonic books, but I couldn't resist going through a new copy of John Salza's Masonry Unmasked: An Insider Reveals The Secrets Of The Lodge. It is a book written to disuade Catholics from becoming Masons, and to encourage Catholics who are already Masons to leave the fraternity. There's even a special prayer for Catholic masons in the back of the book to encourage them to give up the evils of the Lodge. Salza's not a dumb guy, and this is no shrill screed like other attempts by evangelicals who are angry that they aren't allowed to proselytize in Lodge. And it's because of its calm tone in the beginning that I was so disappointed by the book. I don't have any problem with Salza dragging out all of the papal bulls and decrees since 1736 against Masonic membership – the official position of the Church is based on canon law and papal interpretation of that law. And if modern Catholics are comfortable with those interpretations and the doctrine of papal infallibility when speaking ex cathedra, then they must obey those rules to the letter and stay out of Freemasonry. Along with the Rotary and the Lions and the Odd Fellows and the Knights of Pythias. Obviously by the number of Catholics in America, Mexico, South America, Italy, the Philippines and elsewhere who become Masons in spite of those papal strictures, there is a disconnect between what the Church alleges about Freemasonry and what the individual Mason finds within the Lodge. The 21st century Mason is not likely to find anti-Catholic scheming going on in his lodge, and certainly not at the Grand Lodge, or national appendant body level. That hasn't ALWAYS been true, as Salza rightly points out. The AASR-Southern Jurisdiction spent decades locked in a loud, public battle against Catholicism in the New Age magazine. Almost every issue, up until the election of John F. Kennedy, contained at least one article that swiped at "popery, monkery, the Romish church, papists," and most especially in America, Catholic schools. The period right after the Civil War, and again between the two World Wars were times in America of widespread anti-Catholic distrust and hatred. The Masons didn't have a corner on that market. 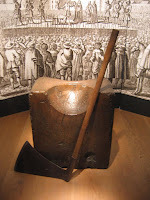 Catholics had been a persecuted minority in the colonial days, and only Maryland was briefly tolerant of Catholics before the American Revolution. For all of the talk in the First Amendment about religious freedom, an overwhelming number of the founders would have trusted a Libyan "Musselman" before they'd have let a Catholic move in next door. The biggest complaint of the Church in the end of the 18th century had nothing to do with whether Freemasonry was a false religion or not. It had to do with the "free thinkers" who were members of lodges who encouraged the sort of freedom of thought and expression that toppled kings from their thrones and dislodged popes from their positions as interpreters of scripture and lawmakers on all things spiritual. Popes saw the handwriting on the wall if more countries went the way of the American colonies. Indeed, when the Papal States were whittled down from a massive block of property across the south of France and Italy to just a few square blocks in Rome in the 1860s, at the hands of Freemasons like Garibaldi, along with Catholic holdings in central and South America by revolutionaries who were Masons, obviously the Church saw nothing but enemies being bred in Lodges. That is why the Church made Masonic membership an act of grave sin, and said that Masons fought against the Church. Masons really did. Freemasonry in the US hasn't fought openly or covertly against the Church in decades. All that jazz about stomping on the papal tiara in the 30° of the Southern Jurisdiction of the Scottish Rite was because Albert Pike was a Protestant who lived through the most overheated period of Catholic hatred in history. (Look up the Know Nothings and the "Pope Stone" in the Washington Monument sometime. Pike was a piker when it came to catholic bashing.) Those sentiments are long gone, and most Americans haven't given Catholicism a second thought since 1960, except when unfortunate headlines appear about priests and altar boys. The Church has a whole lot more to worry about than the effect of Freemasons on it. But what bothers me most is that Salza was a Mason for several years, and he knows just what goes on in lodge and what does not. The same old evangelical gripe comes out – that Masons "exclude" the worship of Christ in Lodge and replace it with an indifferent, generic "Grand Architect of the Universe." Salza knows darn well why overt Christianity – or Judaism, or Islam, or Bahai, or Buddhism, or Hinduism, or Scientology, or Tennessee snake handling – is forbidden in the lodge. It is so that each member may privately worship God in his own manner, however he sees fit, without intruding on the beliefs of his Brother, because a man's personal faith is NONE OF THE LODGE'S BUSINESS. But Salza plays the usual rhetorical game, of dragging out good old Albert Mackey's moldy quote from 1873 that "Freemasonry is a religion." Never mind that Salza would be hard-pressed to find a single Masonic scholar after 1960 who agreed with that sentiment. And I have yet to find a Grand Lodge that comments publicly on the issue that does not categorically state that Freemasonry is NOT a religion. Religion is an important even a necessary element in the life of a man or a nation. Man's feet are upon the ground but his soul aspires to the Infinite. Intimations of immortality are all around us, manifest to savage and civilized alike. Religion touches everything, but it must be understood that Freemasonry is not "a religion." As a whole, it has no dogma, not theology. It has no plan of salvation and most importantly it claims no divine origin. To tear out the religious threads from the fabric of Freemasonry would almost destroy the garment just as removing all religious and philosophical thoughts, works and ideas from any library would empty its shelves. Freemasonry is a learning place open to all men of good report and inventions. It teaches universal moral principles. It has a vast depository of religious history and teachings. It is a powerful influence for good in the world. Thousands of clergy, of all faiths, have been and are Freemasons. They see it not as a religion, but a firm foundation stone upon which they can continue to build. Freemasonry is not and never has been a religion. It has been for centuries past and will be for centuries to come the custodian and teacher of religious philosophy and truth." Coil's doesn't speak for Freemasonry any more than Mackey did – those are their opinions. But if Salza had called the Grand Lodge of Wisconsin, my guess is that every current Grand Lodge officer would have assured him that Freemasonry is not a religion. That is the only official statement that should be of any consequence to him, as a Wisconsin Mason. I don't mind if Salza defends his stance on Catholicism and Freemasonry, but I wish he'd do it honestly. At the back of my mind, I guess what really bothers me about this book is something that may seem trivial to most people. Salza became a Mason and was by his own description an excellent ritualist (which makes me wonder if he learned just the words, or the intent of the words – but that's another day). He became an officer in his lodge. And he took the same obligation that all Masons took. He could have written a well-documented book on the subject without resorting to making a specific point of telling all of the ritual ceremonies, passwords and signs, with a childish "ah-HA!" enthusiasm. As I say, he seems to be a fairly well-read man, with a strong moral conviction – after all, he did leave the Lodge when he sensed a conflict between it and his faith. I can't complain about that. But he knows, or should have known, that the secrets of Masonry that all Masons promise not to reveal have nothing to do with some deep, dark motive of secrecy in the normal sense of the word. Masonic secrecy is about honor, about trust, and about keeping one's word – in the context of gentlemanly behavior handed down to us since the 1700's. The world won't stop on its axis if a Mason tells someone a password or a handshake, knowing full well that the bookstore is filled with exposés of Masonic ritual. But he loses his sense of honor when he does it. And I guess that's one more reason why I regard his book as dishonest, because with all of his talk about fidelity to his faith in God, he gave up part of his honor to men. I was raised as a Catholic, but like many Catholics, I had – and still have – profound disagreements with Rome on a variety of issues. Those are my issues to sort out, and Salza makes a few compelling points, when viewed through the narrow prism of papal encyclicals. But he is dead wrong when he bases his arguments on Masonry being a religion, on especially U.S. Masonry fighting against the Church, and on the nonsense that Masonry teaches a means of salvation that is in conflict with Christianity. Masonry is silent on ALL religions within the confines of a lodge meeting, and I have no more business dragging Christianity into it than I do into a City-Council meeting or a trial courtroom or the floor of the UN, or any other place that is designed to be silent on creed. Freemasonry teaches each man to take a more active interest in his own faith, whatever it may be. If a man is seeking fraternalism that is strictly Catholic-specific, he should become a Knight of Columbus. Freemasonry has always attempted to unite good men, not divide them, and the prohibition of religion and politics as items of discussion within lodge occurred for specific historical reasons. Geocentrism is the view that the earth is the center of the universe, and that the universe (sun, moon, stars, planets) revolves around the earth. Most geocentrists also believe that the earth stands still, and does not rotate on its axis. Geocentrism is in contrast to heliocentrism, which is the view that the earth rotates on its axis and, along with the other planets, revolves around the sun. While it is permissible for Christians to hold the heliocentric view, heliocentrism can only be advanced as a theory, not a certainty (because neither heliocentrism nor geocentrism can be scientifically proven definitively). In fact, three Popes (Paul V, Urban VIII and Alexander VII) have officially declared that heliocentrism is opposed to Sacred Scripture, and condemned the notion that heliocentrism was a truth to be believed with certainty. Instead, the Scriptures, the Apostolic Tradition and teachings of the Church support a geocentric cosmology vis-à-vis a heliocentric one. Nota Bene: I am a faithful Catholic, not a scientist. I am obedient to the Magisterium of the Catholic Church. When presented with a question of faith (such as how God created the universe), I look to the Scriptures, the Tradition and the teachings of the Catholic Church for the answer. I do not rely upon modern scientists who have been unable to prove heliocentrism and disprove geocentrism, especially those who deny the inerrancy of Scripture and generally abhor the Catholic faith. How he can rationalize away little things like satellite observations and deep-space probes of the last several decades, I have no idea. But if this is the kind of reasoning he uses in a courtroom, he has fools for clients, or at least owes them a refund. I daresay that Salza is a young enough guy that he has never lived in a world that was openly antagonistic to Catholics on a widespread basis, the way it has existed in other periods in the U.S. (Charles Carroll, one of the richest men in the colonies, was the only Catholic to sign the Declaration of Independence, and there was a group within Congress who wanted to keep his name off of it, because of his faith). The stupidity of groups like the Klan claiming Catholics were buying land in the Midwest to build a new Vatican, led to armed vigilantes keeping watch up and down the National Road looking for Catholic real estate scouts. Those days are long gone. But there is a renewed effort in the Church that seems to be raising the specter of evil Freemasonry, on the grounds that it is anti-Christian and teaches indifferentism. The Church has far more problems today than infiltration by Masons, and is in need of reexamining its position. However, with Pope Benedict XVI on the throne of Peter, who wrote the 1983 decision reaffirming condemnation of Masonry, that doesn't seem likely for some time. The Masonic publishing business is a fickle proposition. Brother Stephen Dafoe's Masonic Magazine ended after just 8 issues, in spite of providing truly cutting edge Masonic scholarship. Stephen did what no one else in the Masonic periodical business did – he actually paid his authors for their work. Now the Pro Grand Master of the United Grand Lodge of England has just announced that the UGLE's internal MQ Magazine has merged with the independent Freemasonry Today. It's unclear from the statement as to who will be running the magazine now – the first issue under the new editorial staff will be in January. 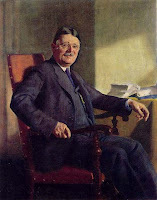 Freemasonry Today has been a truly independent Masonic publication, often featuring articles on decidedly un-mainstream topics and about obediences not recognized by the UGLE. The Pro GM's message clearly says the new magazine will be the official house organ of the UGLE, so I fear the independent streak of FT will vanish. I hope not. If you aren't familiar with Freemasonry Today, two of its notable editors over the years have been Tobias Churton and Michael Baigent. Just in time for this announcement, a collection from the first ten years' articles from FT has just been published, and is available from my friends at Lewis Masonic, which only makes me remember how terrible the exchange rate is these days. 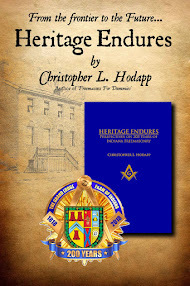 The good news for Masons looking for a truly independent source of information also comes from Lewis Masonic. The Square Magazine is always interesting, entertaining and well worth its subscription. Perhaps with the merger of FM and MQ, the Square will shake things up in Masonic publishing. Just a little local news that makes me very happy. Indiana Freemasons' Hall has been an anonymous building on the Indianapolis skyline for almost 100 years. Every day thousands drive past it, never giving the place a second glance. Admittedly, it's right across from its more popular, gorgeous, super-model big sister, the Scottish Rite Cathedral. Well, Wednesday night, the old girl stepped out of the shadows. 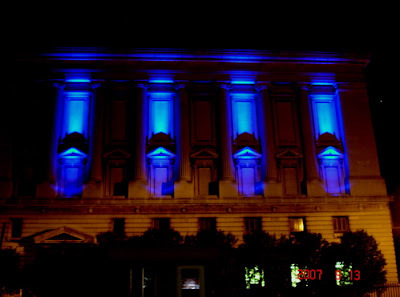 The Indianapolis Masonic Temple Board has installed new LED light fixtures to highlight its architecture and make the Temple pop out of the dark city sky. As Masons, we're all partial to blue, but they can be programmed for any color, since each unit has red, blue and green lenses like a TV pixel. Many, many thanks to Brother Denny Sheets and Barth Electric for all of their hard work in making this project come alive. This year has signalled a major turnaround for the Temple, and I am proud to be a part of it. This is the first, big, noticable change. I See An Evil Secret Society In Your Future! It is apropos of nothing, I suppose, for me to be slightly appalled that the Number 3 non-fiction book today on Amazon, right after Laura Ingraham's Power To The People, and O.J. Simpson's "If I Did It" is the abominable Sylvia Browne's "Secret Societies...And How They Affect Our Lives Today." No, I'm not going to link to her. Fresh from the success of her book Secrets & Mysteries of the World, Sylvia Browne now writes about the clandestine world of secret societies. Sylvia’s research, combined with her amazing communication with her spirit guide Francine, has uncovered the fact that many secret societies affect the lives of each of us every day . . . whether it be in the areas of religion, politics, economy, government, crime, or other worldwide influences. She shares her knowledge of the conspiracies, coverups, long-held secrets, misinformation, and power manipulations of secret societies in both the past and present and how they can affect us today and in the future. From the mysterious secrets of the Knights Templar to the powerful secret societies of the modern age, Sylvia takes us on an amazing journey to explore and unearth the truth. She discusses the amazing influence of the Freemasons on our Founding Fathers, the influence of religion on earth-shaking secrets and terrorism, the agenda of powerful secret societies for a “New World Order,” and much more. Sylvia explores it all, and even gives us information on a powerful secret society that no one has even heard about. So lock your windows and doors and read about these societies and their secrets . . . some will really raise the hair on your neck! Eeeny beany, chili beany, the spirits are about to speak. A powerful secret society that no one has even heard about??!! Saints preserve us! Run for your lives! Sylvia may be lashing out about "secret societies" because the heat is on over her own cult-like organization. And of course, not content to be just a big money version of a carnival sideshow psychic act, Sylvia has her own religion as well. Where there are many laws there is much lawlessness, and men come to despise and ridicule the restraints that are imposed on freedom of action. Corrupt laws, resulting from efforts to amend inadequate legislation by further inadequate legislation, reveal a general ignorance of right and wrong. Where such ignorance exists the ideal function of democracy is impossible, and liberty degenerates into license." Another constraining influence is coming forward with the development of Masonic study. Nothing is so dogmatic as ignorance. A better and more general acquaintance with the history, philosophy, and legal traditions of the craft is certain to make our law-makers more cautions, more intelligent, and more effective. " Nice review of the Initiated Eye exhibit in San Francisco by Matt Sussman in today's San Francisco Bay Guardian. Have a look. Note to Adam - you guys need a website to promote the museum and library. The link from the auditorium teases but only frustrates. After taking the summer off to dig a basement under his house (! ), looks like Brother Ted Bastien and Bugsport are back. There is a line spoken by Sir Thomas More in the film Anne of the Thousand Days that I often think of when fights erupt over the actions of Grand Masters. More says to King Henry VIII's smarmy but trusted advisor, "Master Cromwell, you may tell the King what he MAY do, and what he OUGHT to do. But you must never tell the King what he CAN do." In jurisdictions that allow Grand Masters to make edicts that can set aside existing legislation and laws, there is nothing that can be done. And if a trusted advisor tells them what they CAN do, there is little redress apart from time. As a Mason, it is not my place to go criticizing in other jurisdictions. Number one, it is airing dirty laundry, and laundry that I probably don't have all of the facts about. Number two, such criticisms generally have the effect of hardening the resolve of the very people one is aiming at. And three, it is un-Masonic to go sniping at another Grand Lodge because they are perfectly entitled to make the laws and customs that suit their membership, regardless of what outsiders may think. And in most cases, they reciprocate by staying out of my Grand Lodge's business. With those qualifiers safely tucked up at the top of this entry, I present a series of emails that have been forwarded to me from several sources within West Virginia. It is clear that this is from no tiny faction of malcontents, but that a large coalition of WVa Masons are less than enthused over the will of their 2006 Grand Lodge session votes and last year's Grand Master's agenda being set aside by another Grand Master's edict. And from what I have been told about rules within the GL of WVa, the rank and file, and even lodge leadership has almost no chance to discuss, rebut, or in any other way object to what has happened. Technically, by circulating emails, they are risking their Masonic membership, as you will see from the GM's response. Again, these emails are flying across the Masonic ether – the last one I had contained close to 100 forwards on it – so their contents have ceased to be a secret in anything but name only. this email with the word "unsubscribe" in the subject. them to subscribe to this newsletter. not understand what they were voting for". lived because it has adapted. organism content to dwell in unchanging darkness. Brethren, do not be afraid. like concerned brothers, and ask them to subscribe. e-mails will come from this address. to your list. I found your comments to be both timely and insightful. positive thinking. Thanks for listening. >>God bless you and what you are doing. >>Is there any chance that we could meet and discuss this in person? and everyone else on this mission, the best of luck. >> I became a Mason because I admired it's enlightenment age ideals. I would like to receive upcoming emails from the crusade. Thank you. it you will find my retort. 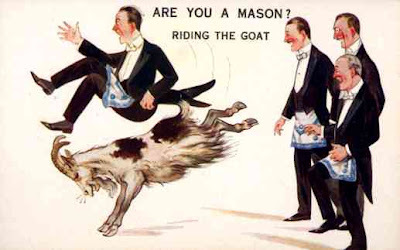 some of our brethren will end up expelled from Masonry. of current Grand Lodge officers. We're allowed to disagree aren't we? "us" as the case may be, have said that they do not love Freemasonry. me from their home accounts, with their full names. these e-mails, you know, stage a witch hunt? a point stronger than a few wrongly convicted martyrs. and identities are secure with me. I do know one thing. In a battle like this, there are no winners. Grand Masters may be smart or dull, visionary or blinkered, humble or pompous, but NONE of them react well to having their authority questioned - namely because we as Masons give them, in many cases, the divine right of kings for their year. I predict there will be some major bloodletting in West Virginia. But the flip side is that when the ranks of a volunteer organization arise and shout foul, especially when it is supposed to be founded on the principles of brotherly love, morality and other laudable traits, the wise man sitting on the throne of Solomon sometimes needs to look to his heart, and realize that what he does today affects the future. Pulling dues cards and charters are what a Grand Master CAN do, but not necessarily what he SHOULD do. Falling back on laws and regulations can sometimes be excuses for men when they lose the confidence to lead or the ability to listen to others. I hope that's not the case in West Virginia. By the way, Thomas Cromwell DID tell Henry VIII what he COULD do, after all. Henry VIII divorced his first wife, and that's where all of those Episcopalians in the world came from. But more to the point of this discussion, Thomas More got beheaded. I thought it was us Freemasons who sacrificed goats? Alice and I will be in San Francisco during the Grand Lodge of California's Annual Communication Sept. 28th -30th, and we are truly looking forward to being there. We lived in Los Angeles (Studio City, actually) for five years, back in the disco era of the late 70's, but we never got to visit San Francisco. Looking forward to reconnecting with Wbro. John Heisner, Dan Sola, Fred Kleyn, San Diego brethren I met in Scotland earlier this year. I've actually been invited to speak on Friday Sept. 28th by Wbro. Adam Kendall and the Henry Wilson Coil Library and Museum as part of their exhibition of The Initiated Eye, a presentation of paintings by Peter Waddell dealing with the Masonic architecture of Washington DC and the founding brethren who were Masons – of which both are the subjects of my book Solomon's Builders. 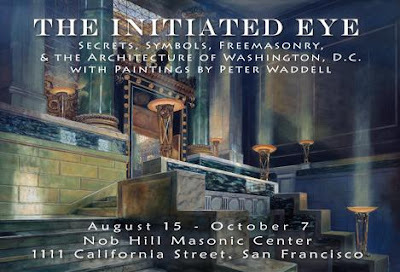 Whether you have the chance to stop by during Grand Lodge or not, I strongly encourage California Masons to support this exhibit at the Nob Hill Masonic Center. The paintings themselves are fascinating and they visually explore a subject that has rarely been depicted in art before. The exhibit started at the Octagon Museum in Washington in 2005, and was well received by the public. It seemed to touch a strain of special interest by non-Masons, since the film National Treasure had just been released shortly before the paintings were exhibited. Wbro. Adam Kendall is doing great programming at the Grand Lodge museum – the exhibit on anti-Masonic propaganda may be a first for US Masonic museums, and has fascinating material. Coming from a jurisdiction that doesn't have a facility like this, I urge California Masons to take advantage of this wonderful resource. On the downside, I'll be too late for the John McLaughlin concert on Sept. 22nd. On the upside: Alcatraz! Thanks to the ingenious print on demand services of Lulu.com, the Knights of the North have made available a new paperback version of Laudable Pursuit. While free downloads are nice and, well, free, this is a great way to have a nicely bound hard copy for your library, lodge or study group. It is available at cost for $ 5.37 plus postage (that's 100% Lulu's charges - we are charging nothing). Still available for free downloads at www.knightsofthenorth.com and in the papers section of Lodge Vitruvian No. 767. The Burning Taper today posted a link to a terrific article about lodge rejuvenation by W:. Stanley Bransgrove on the extensive Mill Valley Lodge website (take a quiet evening and explore its many historical articles. It is a true gem of a site). Something that we have not, in my opinion, been able to fully correct is a badly antiquated initiation fee and dues structure. Neither had been raised since 1972 (and before that since the 1920's) from $139 application fee and $36/year dues. Per capita tax had surpassed 50% of dues. Adjusted for inflation, conservatively, initiation fees should be close to $500 and dues should be at least $149. Yet, our dues were less than most magazine subscriptions; we have had candidates filling out applications laugh at the fee and pull the $139 out of their wallets on the spot. To put it into perspective, most people in my community pay at least 12 times our annual dues (12 months at $36 = $432) for cable television. If you've paid 12 times your lodge dues for cable TV, it seems more likely that you'll want to stay in and see what you've paid for on TV. This last year, after three years of discussion, we did manage to raise our dues to $50 and application fees to $175, which is still, in my opinion, far too low. (The San Rafael Elks Club pays annual dues of $175/year. Similarly, third degree members of the Ordo Templi Orientis purportedly pay $180/year dues.) However, one of the problems that swayed members from voting for a greater increase was the fact that the two neighboring lodges dues and fees would then be much less and might result in a drain of membership toward those lodges, not in my opinion too likely. "I've heard it said from the Golden Gate to the Atlantic, from the north to the south, "Bird, you have a cheap organization." I say to them, "Now, don't measure our organization by the amount of wampum [money] it takes to get into it." But they say, "Now, here, in your City of Topeka, you have a waiting list in five Masonic lodges at a hundred dollars per membership." The Odd Fellows at ten to fifteen, the Knights of Pythias at fifteen, the Improved Order of Red Men at ten, go begging, and lots of our boys who complain about ten fathoms [dollars] to join the Red Men have recently gone into the Masonic fraternity at a hundred, and what is the trouble? May it not be advisable at this time to consider the proposition of making the minimum fee twenty-five instead of ten fathoms. The man that can love a woman for nothing will break his darn neck to love one if it costs him a lot. I tell you, we pay for what is worth while, and you get out of this life and this fraternity just what you put in, and nothing more. 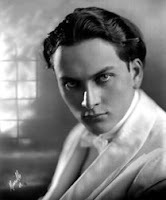 (Record...1924, p. 123.) [Nb. Converting 1924 dollars to 2000 dollars - $100 would now be $977.19; $25 would now be $244.30; $15 would now be $146.58; and $10 would now be $97.72.]" In our estimation, even increasing dues to a respectable level when adjusted for inflation, will be insufficient to fund a budget for the types of activities we envision adding to our current program, such as sponsoring a little league team, sponsoring underprivileged children's attendance to summer camp, and upgrading our own meal functions, as well as maintaining an increasingly expensive building. 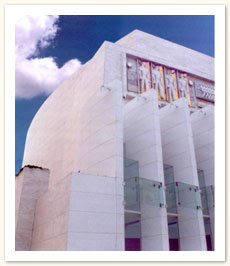 To do so, our Hall Association has developed a new business plan to make maximum use of our biggest asset - the building. There is far more that is outstanding in the article, so please read it, regardless of what you may or may not agree with on the dues question. Over on MasonicMinute.com, there is a discussion over the dreaded dues question in Masonry. Overall, the MasonicMinute host is on the right track. I strongly suggest having a look at Wbro. Nathan Brindle's paper, "Dues That Don't Anymore." It is an outstanding analysis about the irresponsibility and dangers of keeping Freemasonry cheap. The fraternity has made a horrible miscalculation by freezing Masonic dues at its 1960's level. In the comments section, Brother Mike said: "And what would raising dues sharply in blue lodge do to membership in the York Rite, Scottish Rite, Shrine, and so on?" With all due respects to Brother Mike (whom I do not know), that made something go snap in me. Those words have ZERO bearing on a discussion on the merits of Blue Lodge dues levels. We choose to belong or not belong to appendant bodies, but they are nothing without the Blue Lodge. I spend close to $800 a year on Masonic organization dues to belong to a raft of appendant groups. By comparison, the average Mason in 1900, when the numbers are adjusted for inflation, spent close to $3,000 a year in dues, regalia, conventions, etc. My Shrine and Scottish Rite dues are over $100 each, and they are both able to draw on a region of literally tens of thousands of Masons for their membership. I choose to belong to them. But my membership in all of those groups should never be at the expense of my blue lodge (or three of them, in my case). My York Rite dues is unconscionably low. And all three of my lodges aren't charging even close to what they should be. A strong argument needs to be made that the blue lodge, because it has a much smaller membership base to draw upon needs to by considerably higher than the appendant bodies. One of my three lodges was started five years ago, and began with high dues. Inflation has caught up with us, and we need to raise it. My mother lodge has stumbled and struggled up to a responsible level, but it took about 8 years to do it. But my third continues to wallow in the grips of miserliness, at its own peril. It resides in what may be the most beautiful lodge rooms in the state, built and completely paid for and donated by a successful family in the 1920's. But because they failed to plan for the future, they sold the building to an outside group, while retaining a toehold on the top floor. Now, they have burned through their nest egg after using it to pay utility bills, and they want to try to abandon this magnificent facility completely. Simply because they refused to make responsible fiscal judgments over the last 40 years. They are murdering their own posterity, because they refused to expect their members to pay for the value of their irreplaceable facility. What always offends me is that during discussions of dues, there's always one brother who, like a game of Whack-A-Mole, pops out of his seat to shriek that he's on a "fixed income." But what have we done to our lodges since the 1960's but to put them on a fixed income? Heat, water, air conditioning, gas, insurance – it's all skyrocketed for all of us in our homes and businesses. What makes us believe the same is not true in our lodges? Worse, in many jurisdictions, including my own, we set aside the dues of 50 year members. Indiana did this just after WWII (hardly "time immemorial"). It is a noble gesture, and an honorable one. But the WWII generation swelled in size, and robbed lodges and grand lodges of crucial income at a time when membership numbers on the whole plummeted. Now we are paying the price. At the very least, if lodges were required to pay Grand Lodge assessments for ALL members, not just dues payers, dues would have to be raised accordingly. But when GLs simply wipe the 50 year men off the dues rolls, the grand Lodges suffer, and the lodges don't have to do anything to take up the slack. If a lodge wants to remit the dues of a 50 year Mason, that's fine. Charity should begin at home, and the lodge should have to pony up for it. But Grand Lodge should not be forced to suffer for it. Those members still use the facilities, receive the magazines and want to have Masonic retirement homes waiting for them. If we still want these things, they need to be paid for by someone. The flip side of the dues discussion is that if we fight for increases in dues to a higher level, lodges had better be providing an excellent lodge experience for that extra coin. Freemasonry is a whole package - not just fellowship and some bucks tossed in a box for charity. It is a lodge room and building that reflects the heritage of the fraternity, as well as the history and love of the members within these individual neighborhood homes of Freemasonry. It is programming that leaves a brother feeling more enriched when he leaves than when he walked in. It is teaching lessons and understanding symbolism. It is the warmth and welcoming feel of its social areas that make men want to come and stay, instead of meet and flee, or not come out at all. It cannot just be a grey meat sandwich, Sam's Club pop and a card game. Any organization that is cheap to join and belong to requires little sense of commitment, pride or belonging from its members. Any organization that is easy to join is also easy to walk away from. The act of joining the world's oldest, greatest gentleman's fraternity should be an achievement and require certain ongoing responsibilities. Instead, we tell EA's that their presence at our meetings is not required. We keep dues levels irresponsibly low. The appendant bodies are stumbling all over themselves to come up with cheap come-on deals, instead of examining their ongoing mission and programming. In short, the old advertising model of membership on the cheap needs to be taken out behind the barn and shot. If we honestly think that the appeal of belonging to Freemasonry is that we can get it for you wholesale, we might as well shut down tomorrow. Conversely, if you joined a country club and paid a $10,000 application fee, and they charged you $175 a month in dues and food fees, whether you ate there or not, you can bet YOU"D GET OUT THERE AND PLAY GOLF AND EAT! You'd do it three nights a week, plus the weekend, to get your money's worth and the value of your membership. No I am not suggesting that Freemasons charge $10,000 to join or $175 a month to belong. But I'm saying we have to believe in the greatness of ourselves and our lodges again, the way our forebears did.